Club Penguin Cheats by Mimo777 Club Penguin Cheats by Mimo777: Club Penguin Event In The Mine Friday! Cool! On Friday when the rockslide in the Mine is cleared away, Club Penguin has a HUGE event planned! Wow, what do you think this even could be? Cool! I think this has something to do with yetis or the orange puffle. Hmmmmmm? I have no idea! I wonder what the items are. One looks like a tv, one looks like some kind of sign, but the other one is weird! Nice! That looks so cool! Look... A waterfall in the background... 2 waterfalls now??? One in Dojo Courtyard... and one in the hole... Looks like Gary is setting up an investigation... Or Herbert! Hi i think this is a orange puffle machine ,u seen the news it was a pink puffle tha was glowing that means the orange puffle will have tranformation or glowing powers! Also Remember...Herbert did transpot somewhere and we never found him... Is it where the rockslide happened and herbert built another Machine? This HAS to be Card-Jutsu Water!!! Herberts new evil plan. maybe hes trying to capture the orange puffle!? Water dojo???? That would be kool mimo!! u rock mimo!!!! It looks like a puffleinator!! A machine that makes your desired puffle! No idk. But that would be cool! it think this is part of the new mission coming up!! A NEW MISSION. Thats what I think. Probably a member only room. Good thing I got membership for Christmas. A yeti introduction party woot woot! card jitsu WATER! i just know it! Look's like a under water party! U see the fountin? I hope it is about the new mission! Also might be to do with the new mission! You can see exactly what it is if you brighten it up!!! There is a waterfall!! How Cool! This is going to be one of the really cool events on Club Penguin! I think it looks like the cave I found G at in EPF. water Dojo? Its water .....befor u press muli player on click on sensi's amulet (Behind his beard) and It shows you all the amulets complete.. It looks like an invention so it could be something to do with Gary... Equals a new mission maybe!It looks like a cave so... yeti's maybe? And there's a waterfall there so maybe something to do with the Dojo? Whoa, can't wait to see what it is. Thats can be the light party ! I think its a new room or a water dojo. It might hav sumthin to do with a new puffle. Well it should be something about the new mission, cuz they announced it 2 months ago and NO MISSION!!! MAybe its going to be a new mission. I hope so. only thing i know is its for members. I wounlder if it has games? bet you anything that the event is for members only. For some reason,it reminds me of candy. omg thats so cool i cant wait! im going to stay up intill it comes out,even or wake up early! ??? I dunno? Maybe some new random party? so you figured out the reason for the pudding, right mimo? lol jk. I think its gonna be the new mission! i hope it is cuz, i've been waiting for the mission, in like, years and just recently my cuzin made a account she finished all the missions in three days! i think that if there is a card jitsu fire then they will make a card jitsu water and snow! when the card jitsu fire was being built, they had that weird contraption like there is here! A MEMBER PARTY IS WHAT THAT IS! Yeah tht wouldnt be fair for u non members but then again club penguin hasnt been fair for u guys! Ok...... Wat is up with all the talk about Yeties??? Me to I hope its not either. I know all of u are thinking that it might be a water dojo, but face the facts! 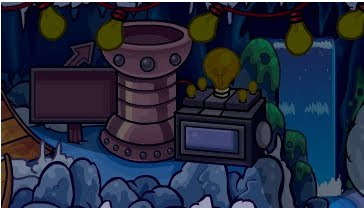 Do u really think CP would release a dojo in the cave? and if so, why another when the fire dojo just came out? Also, look at the picture. One object in the picture looks like a TV. do dojos usually have that kind of technology? Think about it. What you looked up might not be true! Maybe my prediction is right! Theres a waterfall! So maybe its the water dojo! There is a waterfall in the background so it could be card jitsu water! I think it's some sort of secret room. Or it could be a place where zebras especially small funny. Maybe! Is Herbert behind all this? Those mossy rocks look like the ones from the plant party in april. Quite possibly! Is it the Yeti cave? A new mission? So many possibilities! Very mysterious! Maybe! A new mission? The Water Dojo? A Yeti cave...Oh, my! I can't wait! Uuugh I know! I hope not! So many possibilities out there! I really think it's the Yeti cave!...Assisted by the magnificent orange puffle? Hmmmm...*Thinks for a few hours and snaps fingers* You're absolutely right! Good point! In one of the CP blog posts, the CP team informed us about possible yeti caves coming! Answer questions people post in comments. Then write (CPG MOd) next to your name when you answer a question then you'll be set! OMG I JUST THOUGHT OF IT! Ok, so that was originally where Gary's secret lab was. Herbert is planning to shut it down, and wasnts his evil yeti minions to take over it! Falling right into place! (Well maybe not the yeti minions, but the yetis have got to fall in somewhere, am I right?) Tell me what you think! Just answer questions people leave in comments. Then write (CPG Mod) next to your name when you answer a question then you'll be set! Remember to only put (CPG Mod) when you are Modding! Thanks! Awesome! Its some sorta contraption it has G's name all over it! It must be a new surprise mission! Or maybe herbert is making a puffle magnet to steal our beloved puffles!!! Or maybe Orange Puffles mad a contraption and when we tear down the wall we discover Orange puffles which like building things! oh my gawsh! lol wouldn't it be soo awesome if that was a puffle color switcher!!!! like puting red+yelow=orange or blue+green=teal or black+all=dark puffles (example) hot pink or gray! I think there is water under cp and the mine is just going to become one big swimming pool. see the water fall in the back round?! i think it is some thing to do with the card-jujitsu water!! or Herbert. maybe some kind of robotical cave??? Oh my gosh! I sure hope not. Maybe! There are tons of possibilities! I think Card-Jitsu water will be inside the waterfall near the dojo. It is probably about the new mission or something! I agree with what this one anonymous person said, I think that this might be the water dojo, and I have no idea what the orange puffle is doing underground. Why is it that clubpenguin can make alll this happen but said a mission will come out on Decembe 29 and its the January 18 and nothings out! How do you make words bolded? Maybe! I think it has something to do with a new addition to the mine!! I believe it is the water dojo because of the waterfall! P.S.Dont be surprised if u see a stray tap dancing fish with pink hight heels dressed up as a pepperoni inside a rocketship eating a ham sandwich on Friday the 13th on Thanksgiving Eve. Do you guys think that this could be connected to the new mission? Riley could be right! Do you think there will be a Card Jutsu Water game??? Well please respond!!! Yea. Im pretty sure the plants were put in box world... maybe thats why the portal is back. Hey, what's up, Mimo! This is Kagenamix123! Can you advertise for the park army? Ok, here are the details. If anyone wants to join the Park army, go on Sabertooth, the server at Club Penguin, and see me at the forest! I might be available tommorrow and this week. Wanted: penguins that are serious, love war, old (maybe rare), and take this seriously. Thanks! oh Im allie by the way! These are all good guesses , but my guesses are water dojo,orange puffle or herbert (mission 11). new misson and new water dojo we get a double wammy so kewl i can not wait for this to come out! I smell a Mission and Herbert! I think it is another ninja related room. The volcano is a fire room and I think this could be a water room. Now all that is missing is snow. P.S. Could I be a CPG mod Mimo please. I have posted lots recently and all seem kool to me. Lets hope it is a new mission. Lets be patient! Nice theory! Look closely! A mini version of the waterfall that was at the adventure party! If you have doubts, check the background! Mimo i think Cps' gonna have a prehistoric fossil xibit! evidence is here! Rockslide: I think the rockslide had rocks that were fossils! Machine thingy in sneak peek: Its probably a fossil restorer! we will put fossils in it and the fossils be alive! What the fossils may be: Orange puffle, which we can buy from now on and prehistoric penguin colour!! COOL! Maybe the machine in the picture might be G's invention. You never know. And its not polite to laugh. Yah, its not a Dojo, probably a mew Mission!! Intresting Theory. Sounds like Something Mimo would write! I think i have find theories!Look on the side! There a big white thing! That look like a puffle statue, so maybe it that the yeti puffle statues or maybe that sign of a new puffle colour and yeti cave! I don't think that that a new mission because if you look closely, that need tho to do with the rokcslide at the mine, and that a sign of a new room! P.S Hot to become a mod? Same with me! Those are my EXACT guesses!! I think it's part of the new mission! 1. There is also a Waterfall up near the Dojo Courtyard, so it will most likely be the instead of in the Mine. 2. We already know that the path to Card Jitsu Fire is under the steps in the Ninja Hideout, and we see three sets of steps and three elements close to each set of steps, coincidence? 3. Lastly we also know that Card Jitsu Fire was advertized of club penguin before it came out, so why would Card Jitsu Water not be advertized? Anyway I can't wait till Friday for this new event and can't wait till we have all the elements as a Ninja! (I think in the center of the floor in the Ninja Hideout will open when we have all of the elements! a members project. definitely a members project/party. if you see closely on top of the picture it has light bulbs just like the grand opening of the dojo!!! Looks like some sort of water fall thingy, a party? A new mission sneak peak like? Only time will tell lol!!! i cant wait itll be so exciting i hope it is the water dojo . i hope not for members only! i hope its for everyone! and not for members only! WOW I never thought of that lol!! Or maybe it's a machine for smelly zebras and makes them unsmelly so we can ride them and escape CP....somehow....I'll be working on that idea for a bit! Maybe....Keep sending in your ideas to Mimo, i'm sure he'll post all your awesome ideas!! Don't be too sure about that...It could be the new mission...A new sneak peek of a new party...Hey remember at 2009 Halloween, there was a secret room for members behind there! Lol! Anyway you could be right...Only time will tell...Lol! Love saying that! Hi Club Penguin gang!! It's been ages for me!!! Been grounded and stuff like that lol!! Anyway what's Chobots? Orange puffles may like digging and we might have to catch the orange puffles in the cave! I agree, I hope its a new mission because there hasn't been one in so long. Sorry im not commenting. Im having computer troubles. maybe its an addition to the volcano? like a secret fire ninja room? I think you put objects in there to make TREATS!! I think that picture is a pic of construction for...THE WATER DOJO! cause you know how big the fire dojo was soo...the water dojo mabey and i think the water fall at the dojo might link to the waterfall in the picture for like that or the waterfall goes down to a pond for the water dojo and other than that there will be yeti caves too.Mabey a yeti adventure! Hiya! It has been ages, yes. Anyway welcome back! Also Chobots is a game like Club Penguin but you don't need to pay for a membership to get awesome clothes! I have some cool clothes and i'm not a member, also they have rain partys where it rains rare clothes. I hope this has helped you, I hope you join and don't hessitate to ask about anything else! That would be pretty cool for members anyway because if your not a member you can't go in to the fire room. But that would be cool. Wow Cool I think it has to do with the Yetis's or something right??? Of the Mine? From the Club Penguin Blog. To get there, go to the CP homepage and click community, and there will be a box with a blog post in it! Did I help you? Just copy and paste someone's comment into the comment box. Then do ~~~~~~~~~~ or ------- or anything to seperate your comment from theirs. It's easy! I'm sorry if this is totally not helpful! I don't play on Chobots very often, but it's a website where you get to play games and buy stuff, that actually doesn't require a membership, as far as I know!...But there IS citizenship, not membership. But you don't need a citzenship to buy stuff, as far as I know! (I HAVE only been on Chobots for a month but...) You should totally check it out! Errr...Is it not the CPG12 anymore? Cuz last time I checked it was the CPG12...Did some people, like, drop out? Omg, what is up? Did we lose 2 members of the CPG# group? What did I miss? Someone answer! Weeeellllll..You see, it's not all that simple. Mimo can't just MAKE you a Mod. You have to answer peoples question(s), not just once. You have to do this often, I'm talking a LOT! And, maybe, when the next Mod overhaul comes, Mimo will premote you as a CPG Mod! Oh, and remember to put (CPG Mod) next to you name each time! For more info, view the rules on the right side of the site. (Scroll down!) Good luck! Yeah, one of my (well really my #1) favorite cartoons! I saw that episode with the Chum Caverns, that was really...odd. Lol! It's easy! Use HTML tags!..Ok, ok, you've probably never heard of them. For bold, just do < then b then >...all together, no spaces in between! If you do it correctly, it should look like this. To end, just do < then / then b then >. Same with italics just replace the b with an i! and whatever this is called, just replace the i or b with an a! Sorry if this is too long! Well, technically they didn't say that it would come out on the 29th. At least not that I know of! Just be patient! Nothing to do with the comment! Sorry! But how do you make the heart? I know that the < and the 3 make an emote heart thingie, but... like <3 that. How do you do that? Can you teach me? Most likely going to have something to do with the mission. Looks like G planted a few inventions in there if you ask me. or could it be HERBERT? How are you pplz so sure there will ever be an orange puffle anyways? Probably has to do with the new mission though. It's a cave party! You just know it's gotta be! Well it could be. But it would probaly be a party or a new room. Oops - sorry - I didn't put (CPG Mod in training) next to my name!! I don't know. It might be Gary or Herbert or BOTH, or maybe it has NOTHING to do with any of them. Don't you just love it when Club Penguin gives you a sneak peak and leaves YOU to think what it might be? No one tells me anything! I don't know don't ask me..Last time I checked it was CPG10. And anyway I go off for a few days next thing I know everyone has added another 5! It's probrably a member event, Don't get overexcited. The Cove Is Ninja Related! The Camp-Fire is fire, The little pool is water and the snow is covering the whole place!